Last month, the Coaldale and District Chamber of Commerce held its annual Awards Banquet and Awards Ceremony. A special tribute award was presented to Dennis Overweg, owner and operator of Dennis’ Dirtworx. Dennis and his wife Julie and family members were present, as Dennis received his special tribute award. Dennis, according to a speech presented at the awards ceremony, was born in the Netherlands and immigrated to Canada with his family in 1998 at 11 years old. Dennis was always deemed a hard worker by his family. Growing up, his parents always thought he would be a farmer. As a young boy, he helped his Opa milk cows before school and after coming to Canada he continued working on farms, including dairy farms, potato farms and feedlots during his school years. After graduation, Dennis received a call from Southern Excavating and was offered a job, and this is where he started his career as an operator. In 2009, Dennis purchased his first piece of equipment — a mini-hoe excavator at an auction. Dennis’ Dirtworx started up shortly after and has grown to the strong business it is today. In speaking with his family, his long-term goal was to have 25 high hoe excavators in his inventory, according to the speech. He is over half way there with 14 — not a bad accomplishment considering he is turning 28 this July. Dennis currently is based out of the industrial park in Coaldale and recently he purchased property to construct a new shop and office space. Also, a member of the Coaldale Kinsmen Club asked Dennis if he would help the Kinsmen by moving and levelling dirt on one of the undeveloped phases of Cottonwood, so the Kinsmen could have their annual “Carnage in Coaldale” Demolition Derby. Dennis agreed and had the site prepped in a matter of hours. Then talks began in regards to the racing area, requiring a safety burm, to prevent cars from leaving the track area. Historically, the Kinsmen used an antique ditcher that was pulled behind a tractor. Dennis offered to excavate a trench, 360 feet long and three-feet deep around the entire perimeter of the track, which took countless hours. Dennis — being the particular guy he is — the speech noted, tweaked the track a couple of times to make it perfect. Then, according to the speech, the rain came, and it rained some more, and it rained more again and then it looked like the Kinsmen would need to cancel their derby for the 2013 season. The Kinsmen are part of a racing circuit that travels throughout Alberta and British Columbia. If a race day date is missed or rain delays the date, the Coaldale Kinsmen won’t have an opportunity to host the Demolition Derby again for another year, according to the speech. To the rescue came Dennis and his equipment. Between downpours, his equipment graded and contoured the grounds, so the water could run off and he continued to do this for the week leading up to race day. After deciding to move forward — the rain clouds departed, the sun came out and along with Dennis’ commitment, the event was held and raised nearly $24,000 for the Cottonwood Kinship Playground project. 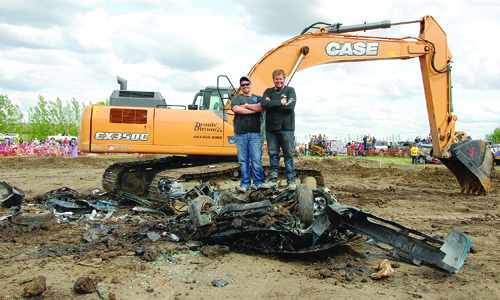 Dennis has also provided the thousands of spectators that attend “Carnage in Coaldale” Demolition Derbies with entertainment — by demolishing a car with his excavator. As Cottonwood began to grow, the Kinsmen Club of Coaldale was approached by a group of parents to see if the group would help build a playground for a new development, which housed many young families. The Kinsmen, according to the speech, agreed and started fundraising and planning the $250,000 project. Dennis was approached to see if he would be interested in working with the Kinsmen once again and without hesitation, he agreed and prepped the site by grading and removing sod and top-soil, which allowed the group to start the build. The speech stated, his act of kindness saved the project. Dennis also participated with Phase 2 of Kinship Park, by once again grading and removing sod and top-soil. Phase 2 consists of a combined outdoor skating rink and basketball court that is currently under construction and will be completed this spring. Again, Dennis donated his time and equipment for the betterment of the families living within the community and surrounding area. According to the speech, just when you think Dennis has done his fair share of community projects, he stepped up to the plate one more time by working with the Coaldale Kinette Club. The Kinette’s raised funds and built a $70,000 playground in the Garden Grove subdivision with Dennis’ Dirtworx once again doing the site prep work, saving the Kinette’s thousands of dollars. Dennis also helped with flood mitigation last June, when Coaldale experienced a huge rain event, which caused wide-spread flooding in the community of Coaldale.